Browse for brake cables by vehicle make and model. 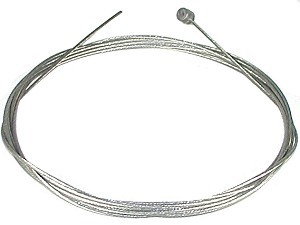 108" (9 foot) long universal fit brake cable with barrel shaped brake lever connector head. Fits virtually all electric scooters and bikes. Trim cable down to size needed after installation. 63" brake cable with 60" (5 foot) brake cable housing. Barrel shaped brake lever connector head. Nickel plated brass ferrule end caps. Brake cable and housing can be cut down to size needed during installation for the perfect fit. Aluminum brake cable end cap. Prevents brake cable from unraveling on end. Makes brake cable installations look neat and professional. Crimps onto end of brake cable. Nickel plated brass brake cable housing ferrule end cap. A must have part when shortening brake cable housings. Crimps onto end of brake cable housing. 25" brake cable with 20" brake cable housing. Barrel shaped brake lever connector head. Nickel plated brass ferrule end caps. 28" brake cable with 23" brake cable housing. Barrel shaped brake lever connector head. Nickel plated brass ferrule end caps. 35" brake cable with 30" brake cable housing. Barrel shaped brake lever connector head. Nickel plated brass ferrule end caps. 40" brake cable with 34" brake cable housing. Barrel shaped brake lever connector head. Nickel plated brass ferrule end caps. 45" brake cable with 39" brake cable housing. Barrel shaped brake lever connector head. Nickel plated brass ferrule end caps. 54" brake cable with 48" brake cable housing. Barrel shaped brake lever connector head. Nickel plated brass ferrule end caps. 68" brake cable with 61" brake cable housing. Barrel shaped brake lever connector head. Nickel plated brass ferrule end caps. 73" brake cable with 67" brake cable housing. Barrel shaped brake lever connector head. Nickel plated brass ferrule end caps. 81" brake cable with 75" brake cable housing. Barrel shaped brake lever connector head. Nickel plated brass ferrule end caps. ElectricScooterParts.com carries various sizes of brake cables and brake cables with housings for electric scooters, electric bicycles, electric dirt bikes, electric go karts and most other types of small electric vehicles.